Available August 1 at Noon CT through August 31 at 11:59 p.m. CT, or while supplies last. Every day, teachers are making a difference in the lives of their students and moving mountains in the classroom. Now, you can help make a difference, too, by sharing this month’s Force For Good Gift Set! 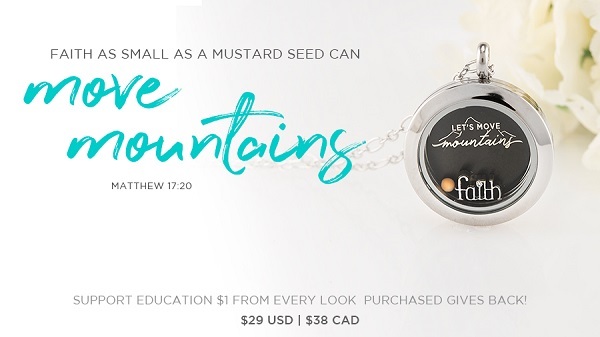 For every exclusive Medium Silver “Let’s Move Mountains” Gift Set purchased in August, Origami Owl® will give back $1 to Extra Yard for Teachers in the U.S. and Salvation Army Canada to support education in the classroom. Extra Yard for Teachers is a platform that inspires and empowers teachers through the implementation of programs that focus on resources, recognition, recruitment and professional development. Salvation Army Canada’s Backpack Program helps children start the school year off right by giving each child a new backpack filled with grade-appropriate school supplies. Where: The “Let’s Move Mountains” Gift Set is located under Shop > What’s New > Force For Good > Support Education. Medium Black “Let’s Move Mountains” Plate – Exclusive! Mustard Seed Charm – Exclusive! Read the FAQs to get more details. You can find all your shareable social images and flyers under “Monthly Exclusives” and “PDFs” in your My O2 Connection mobile app and the desktop version in your Back Office under Designer Resources > My O2 Connection. You can also find the flyer in your Back Office under Designer Resource Library > Monthly Exclusives. Not yet subscribed to the My O2 Connection app? Read this to learn more. Don’t forget, our Live Sparkly Multi-Color Stardust Swarovski® Crystals and “By Your Side” Silver Ribbon Memento with CZ give back to our annual Live Sparkly® “Share the Sparkle” campaign. You can learn more about our Live Sparkly “Share the Sparkle” campaign here. Hold a Force For Good Fundraiser! If there’s a cause you’re passionate about, no matter what time of year it is, you can hold a Force For Good Fundraiser! You can find the Force For Good Fundraising Toolkit in your Back Office under Designer Resources > Force For Good. We have everything you need to hold a successful fundraiser including email templates, call scripts, a flyer and social images.